Payments transformation programs are in full flight. Open banking API requirements, new real-time and cross-border schemes, and market demands for digital innovation are forcing banks to re-imagine their payments infrastructure. Progress is slow. Payments projects famously run over budget and behind schedule. This is because the complexity of integration is underestimated, and the right tools are not deployed. 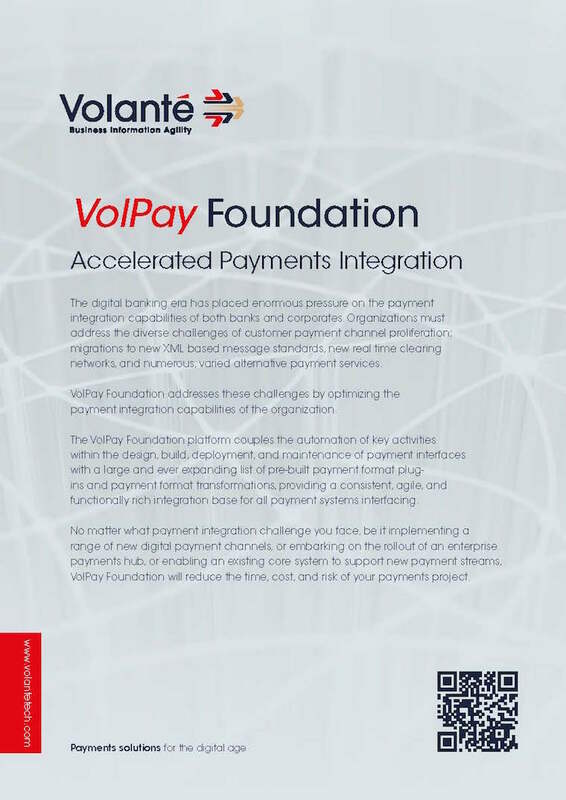 VolPay's built-in payments integration acceleration platform reduces the cost, complexity and time of integration in payments transformation, allowing banks to focus their resources on what’s most important: their business and their customers. We have every confidence that we will meet our customers’ ongoing demands for new products and services quickly and efficiently, while also remaining compliant with new regulation. Zero CodeThe secret to our ability to accelerate payments integration? Zero code. Even the most complex integration components can be developed and delivered using GUI design-based configuration which auto-generates code, documentation, and test scripts. Want to look under the hood at the technology powering VolPay’s integration acceleration platform? That's Volante Designer.